Despite President Donald Trump's promises, it looks like the Keystone XL pipeline won't have to be made out of American steel after all. A White House spokeswoman said Friday that the "buy American" rules in Trump's order clearing way for pipelines won't apply to the high-profile Keystone project, which will carry crude oil from Canada to the U.S. Gulf Coast. "The way that the Executive Order is written is actually ... specific to new pipelines or those that are being repaired," the spokeswoman said. 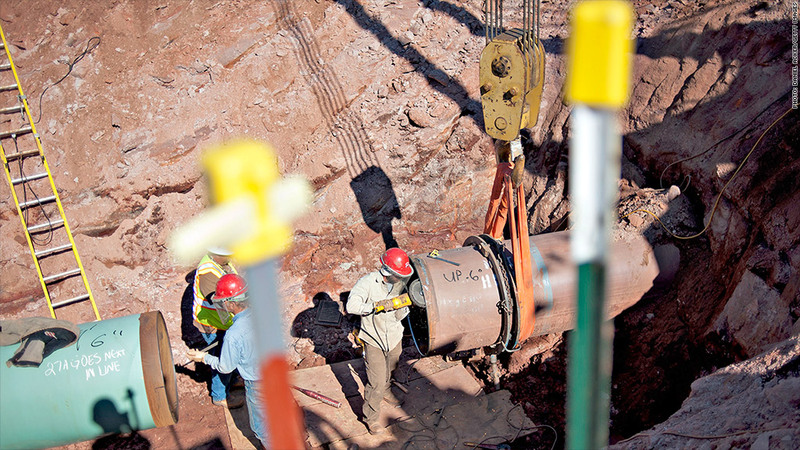 "Since [Keystone] is already currently under construction ... it was hard to go back. Everything moving forward would be all under that executive order." But Trump has vowed repeatedly that only steel from American steelmakers could be used on Keystone as well as other U.S. oil pipelines. He said so the day he signed the Executive Order, as well as in his address to Congress this week. Trump also alluded to the requirement when he met with U.S. Steel (X) CEO Mario Longhi at the White House last week. "You're going to be doing pipelines now, you know that?" he said to Longhi. "We put you heavy into the pipeline business." And he has said the buy-American rules were something he insisted on at the last moment. "This took place while I was getting ready to sign," he told the CPAC conference last week. "I said, 'Who makes the pipes for the pipeline?' Well, sir, it comes from all over the world, isn't that wonderful? I said, 'Nope, it comes from the United States or we're not building one.' American steel. If they want a pipeline in the United States, they're going to use pipe that's made in the United States, do we agree?" But it's not clear that Trump's executive order could require the use of American-made steel on any pipeline. The order calls for the Secretary of Commerce to draft "Buy American" rules for pipeline construction "to the maximum extent possible and to the extent permitted by law." TransCanada said late Friday it has already has purchase agreements for the steel pipe it will use on Keystone. It said half of the pipe will come from the Arkansas plant of India-based steelmaker, Welspun. Another 10% will come from a Welspun plant in India, the rest will be imported from Canada and Italy. In addition, it has already purchased about $800 million worth of other goods from U.S. manufacturers. "This project will support U.S. energy security, create thousands of well-paying U.S. jobs and provide substantial economic benefits," the company said in the statement. But most of those jobs are short-term. Once the pipeline opens it would require only 35 full-time permanent jobs to run it, according to an government estimate that TransCanada does not dispute.